Fabric markers are an arts and crafts accessory used to paint and personalize clothing, blankets, tapestries and curtains. Use fabric markers to color in specific designs or create a tie-dyed pattern without the mess and hassle of using dye. 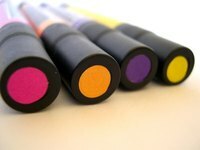 Provide supervision with young children using fabric markers when making craft projects. Allow the fabric marker paint to dry for three to five days. Test the surface of the paint to ensure it is dry.